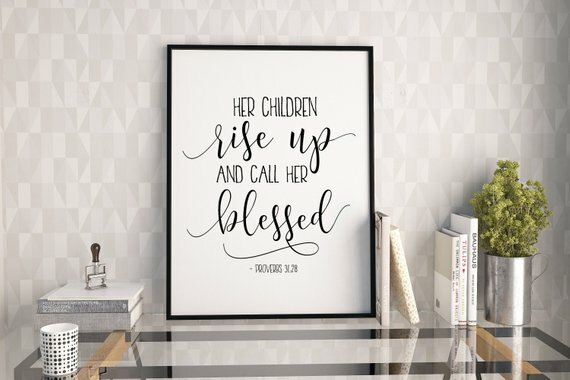 How i long for my child to call me blessed someday. Am not saying that a child who goes the wrong way doesn’t wound the father, but the mother bears the brunt more. She grieves more. She carries the burden more. So train your children in the ways of the Lord. The winds may blow, they may falter along the way, but the sure thing is, the seed(s) that you planted when they were young will still be in them. They will soon return to the cross. They will soon kneel at the feet of Jesus. Your conduct around them will cause you to become an object of praise to your children and to your husband. Do they have your testimony that you are a woman who prays? A woman of faith? A woman who loves them? Does your husband have your testimony too? Can he praise you genuinely because you have been good to him? See, you don’t need to force praise out of his mouth because he will surely praise anything good! Look at how men talk about their phones, cars, home theater, iPad(s) etc. but rarely praise their wives. Are they entirely to blame or are we missing something somewhere? We are good in forcing our own way down their (our husbands) throats, but do you realize that praise comes from inside out? Why do we praise God? It’s because of what HE HAS DONE TO US! Praise emanates from our souls because we feel that HE HAS DONE US GOOD. We have tasted Him and we know His wondrous works. Being praised is biblical. Let’s not dilute the word because of the dysfunctional relationships that we have created with our own hands, and because we are either envious or jealous of them that seem to have found their path, we hate on them. Instead, could we ask God to mold us to be good wives to our husbands? But do you realize that as much as love is unconditional, it’s also conditional? God does have conditions too, yet HE IS LOVE. Let me show you! IF you obey me, then you shall be my treasured possession (Exodus 19:5). Ask yourself this, are you good to your husband? Are you an amazing wife? Make it your point of being an amazing, commendable, laudable deserving wife to your husband, it will automatically fill him with praise for you and so will your children! They will call you blessed! Working a marriage out – is simply that working. And it’s important to remember that you DO have a part to play too. Marriages don’t just work out cosmically! ‘…For whosoever believes in Him shall not perish but have everlasting life…’ Condition right there.